Welcome to the Indie Author Weekly Update. This week’s update covers it all from book marketing to pen names to Instagram and more. They are all great posts! 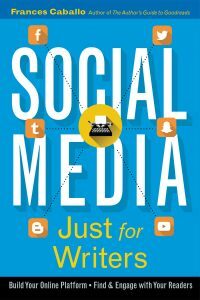 Whether you’re setting up your social media for the first time or wanting to take it to the next level, get the newest edition of Social Media Just for Writers. Author of this blog: Frances Caballo is an author and social media strategist and manager for writers. She’s a regular speaker at the San Francisco Writers Conference and a contributing writer at TheBookDesigner.com. Frances wrote several social media books including Social Media Just for Writers and The Author’s Guide to Goodreads. Her focus is on helping authors surmount the barriers that keep them from flourishing online, building their platform, and finding new readers. Her clients have included authors of every genre and writers’ conferences. Not sure how you’re doing online? Sign up for her free email course. Welcome to the newest edition of the Indie Author Weekly Update. The big news this week is Facebook, which changed its algorithm again making it more difficult for readers to see your Facebook posts. Read up on Facebook and please don’t bypass Ben Zackheim’s post; it’s phenomenal. Join Ricardo Fayet, a founder of Reedsy, and I on February 6th for a conversation about book marketing and Facebook advertising.